Delicious, light lunch idea that’s quick and easy to make. 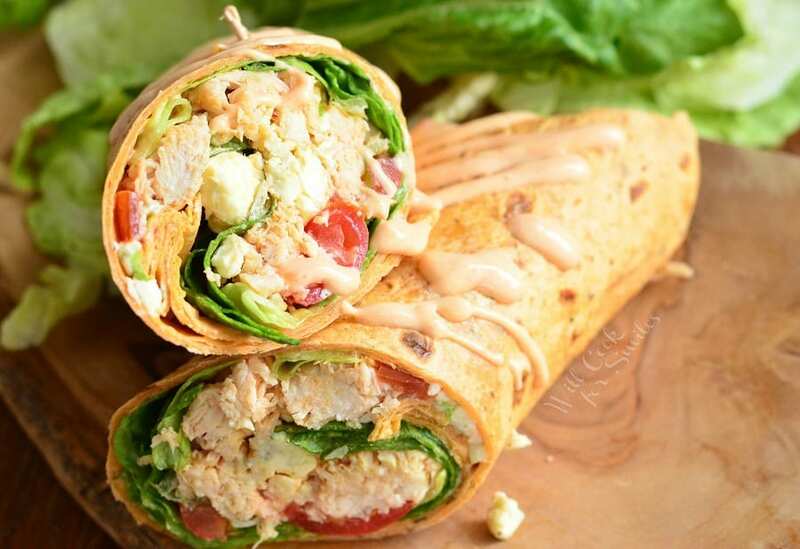 This Buffalo Chicken wrap is made with chicken cooked in buffalo sauce, blue cheese crumbles and veggies. Oh, and don’t forget the homemade ranch dressing. I just love buffalo chicken anything. I always try to make it in different ways…salads, nachos, sandwiches..etc. The combination of wing sauce, blue cheese crumbles and ranch dressing is just the best. 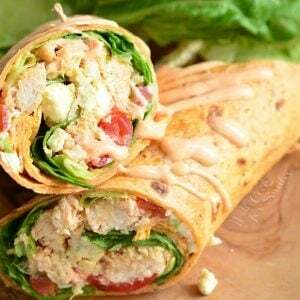 This chicken wrap is something I make for myself for lunch quite often. It’s very simple, light and satisfying to my taste buds and tummy alike. I’ve started to make my own ranch dressing as well and it’s not just a much better tasting option, it’s also convenient to make a small batch of dressing right wen you need it. Once you starting many your own, you can’t turn back because no store-bought dressing will taste as good. For Ranch: Simply whisk all ingredients together until completely smooth. You can prepare it ahead of time and store in in the refrigerator, in a jar with a lid. You can keep it for 5-7 days. If your tortillas are cold then warm them up in a microwave for about 5-7 second to bring to room temperature. Don’t try to wrap a cold tortilla because there is a high chance it will crack. Chop cooked chicken and place it back into the skillet where you cooked it. Mix chicken with the sauce left in the pan. Salt to taste. Lay tortillas flat. Divide lettuce, tomatoes, celery, blue cheese crumbles, and chopped chicken between the two tortillas. Drizzle ranch dressing over the top. Roll carefully, tucking in sides as you roll. Secure with toothpicks and cut in half. 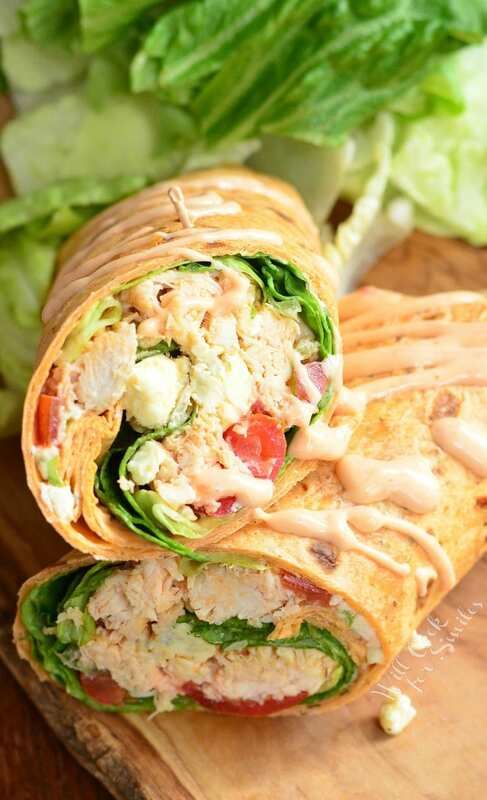 This Buffalo Chicken wrap is made with chicken cooked in buffalo sauce, blue cheese crumbles and veggies. Oh, and don't forget the homemade ranch dressing. For Ranch: Whisk all ingredients together until completely smooth. Cook chicken tenders in winger sauce until completely cooked, about 15-17 minutes. Lay tortillas flat. Divide lettuce, tomatoes, celery, blue cheese crumbles, chopped chicken between the two tortillas. Drizzle on top with ranch. Don’t forget to sign up for email,so you won’t miss any new recipes. Originally published on Will Cook For Smiles on August 28, 2011. Looks like a great thing for us to have on our boat on lake weekends. Thanks. 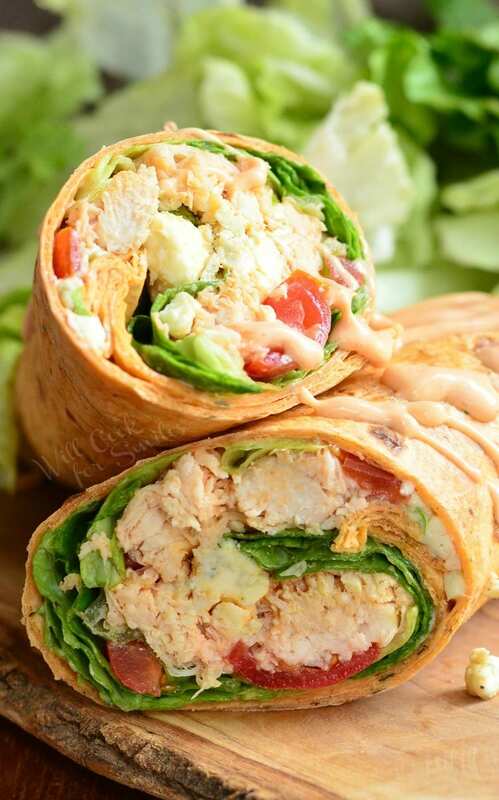 I can just taste the tangy goodness of this wrap! Thanks for bringing your flavor filled wrap to ON THE MENU MONDAY. Thanks for posting this great idea. My son said he ate buffalo chicken wraps at school last week and claims he loves them. I think I will try them at home for dinner one night! And is it really THAT easy to make buttermilk ranch? I just love ranch. I would swim in it, like Scrooge McDuck through his piles of money. I love a great wrap. Thanks for sharing this recipe. Oh these are definitely on my list to make soon! I can’t wait to make my own ranch dressing too. Thanks for sharing. This looks so good. I can’t wait to try it out. I am really looking forward to making the Ranch dressing! Hi Carli! If your husband doesn’t normally mind cold chicken, then I’m sure it will be a great option for him. Just in case he doesn’t like cold chicken breast, you can always substitute deli sliced chicken and add a little buffalo sauce. You can wrap it in some parchment paper and pack it in a brown bag for him. Delicious recipe! I poached the chicken in water and shredded it in my stand mixer with buffalo sauce, dried parsley, a little butter and ranch! I used jalapeno cheddar wraps! Oh yum! I love the addition of jalapeno cheddar wraps. Thank you, Crissy!